Winston Hall is home to excellent research and teaching space. The Biology Department is housed in Winston Hall, a 60,000 sq.ft. building on the southern edge of Wake Forest’s Reynolda Campus. 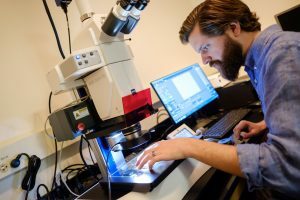 Winston Hall contains modern research and teaching laboratories, conference rooms, faculty and staff offices, and a microscopy suite staffed by a full-time imaging specialist. Indoor and outdoor animal facilities are available for housing small mammals, birds, reptiles, amphibians, and fish. Two greenhouses attached to Winston Hall house plant experiments, and a research apiary is available for the study of honey bees. Teaching facilities are extensive and feature a large auditorium (126 Winston), numerous multimedia lecture rooms, teaching laboratories, and fully digital seminar rooms. All research and teaching space is connected to the campus high-speed network, and the department is supported by a dedicated information technology specialist. Graduate students have offices within research laboratories or in nearby office space. Wake Downtown is housed in Winston Salem’s high-tech research park, Innovation Quarter. The downtown campus is home to state-of-the-art research facilities and classrooms that are side-by-side with their medical school counterparts. Students preparing for research or pre-health careers will develop greater insight into the experimental approaches and results that lead to the current understanding of biomolecular function. Abundant undergraduate research opportunities are available for students in WFU labs and those of several medical school departments already in the Innovation Quarter. Biology graduate student Justin Watkins photographs root hairs on an Arabidopsis root in a microscopy lab. The Microscopic Imaging Core Facility is located in Room 002 Winston. The suite’s four rooms house a Zeiss Axioplan upright microscope, a Zeiss AxioObserver inverted microscope, a Leica MZ16 FA stereomicroscope, and an Amray 1810 scanning electron microscope. An open central area features high-performance workstations dedicated to image processing and analysis. The facility also houses an Olympus SZX 12 stereomicroscope and essential equipment for sample preparation, including a rotary microtome, vibratomes, a sputter coater, and a critical point dryer. A laser scanning confocal microscope (Zeiss 710) is housed in a dedicated auxiliary facility located in Room 009 Winston. Visit the Microscopy site (click here to visit).